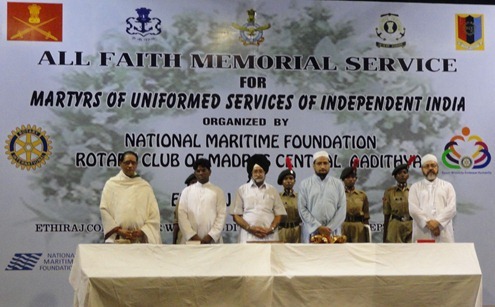 ‘All Faith Memorial Service’ for Martyrs of Uniformed Services of Independent India was jointly conducted by the National Maritime Foundation (NMF), Rotary Club of Madras Central Aadithya and Ethiraj College for Women at Chennai on September 14, 2011.
was conducted to pay homage to all martyrs of uniformed personnel including the Armed Forces, Para military forces, Police etc., who made supreme sacrifice of their lives for their countrymen. 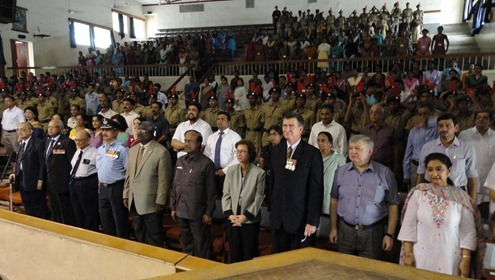 was attended by representatives from all walks of life and faith: NCC cadets in uniform, college students, serving and retired members of the Armed Forces, Rotarians, elite of the city including diplomats from US, Russia, Canada and Australia. 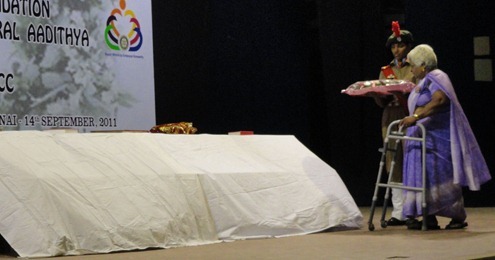 was conducted in the Auditorium of Ethiraj College for Women, Egmore, Chennai. five sacred texts namely the Bhagavad Gita, the Bible, the Koran, the Guru Granth Sahib and the Zend Avesta were ceremoniously brought inside the auditorium and placed at a specially created Altar. eminent representatives of the five faiths then read out appropriate extracts from their respective texts. distinguished members representing various organisations thereafter placed wreaths at the Altar. 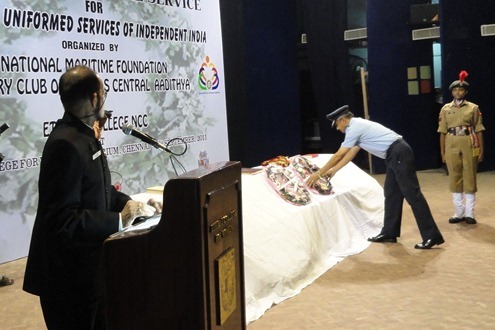 collective homage by the whole audience was paid with Army buglers sounding the “Last Post” followed by two minutes’ silence observed in memory of the martyrs of uniformed services of Independent India. 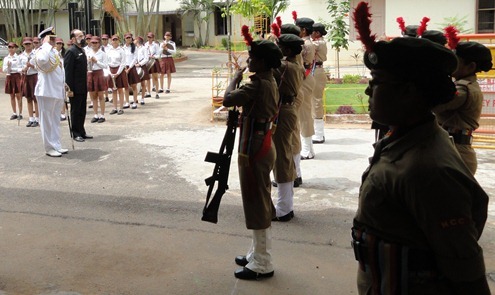 Guard of Honour by NCC cadets to receive the guests. Col Shivanandan, Head Quarters, ATNKK Area. Commodore Rajeev Girotra, Naval Officer in Charge, Tamil Nadu and Puducherry. Priests representing Hindu, Christian, Sikh, Muslim, and Parsi faith at ‘All Faith Memorial Service’. Some of the distinguished members placing wreaths at the Altar. Group Captain Kekre, Rep Air Officer Commanding, Air Force Station, Tambaram. Collective homage by the audience. Lieut General (Retd) Sundara Rao, Major General (Retd) CT Chari, Brigadier (Retd) Subramaniam, Group Captain Kekre, Rotary District Governor Sampath, SRM University Vice Chancellor Dr Ponnavaikko, U.S Consul General Jennifer Mclntyre, Australian First Secretary Michael Long, Russian Deputy Consul General Sergey Soloviev and Mrs Sati Randhawa. Last year this service was conducted on December 14, 2010. Thanks to Commodore (Retd) S.Shekhar, Indian Navy, Regional Director, National Maritime Foundation, Chennai Chapter to organise this excellent event. Previous post: How AirTel DTH Cheats Customer to Upgrade to HD Recorder?